Is Alcohol Doing More Damage Than You Realize? Few beverages in the world are as popular as alcohol. 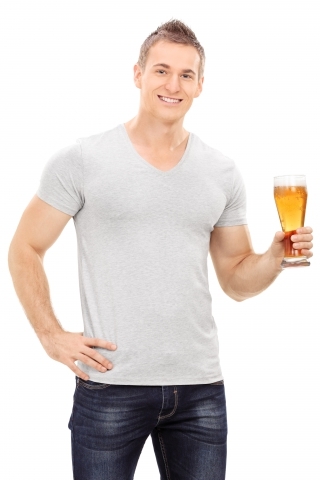 For thousands of years, humans have been consuming alcohol in one form or another and, in our opinion here at Balboa Victory Dental Office, they are not likely to stop any time soon. While the effects of sugar and other substances have been well documented in relation to oral health, fewer people are aware of the effects that alcohol can play. To remedy this, we are going to use today’s post and the following post to go over some of the ways that alcohol can negatively affect your oral health and why it is important that you talk to your dentist if you are experiencing any of the issues that we list. Continue reading below to learn more. With summer in full swing, more and more people are spending time outdoors, hanging out with friends, and, in many case, drinking alcohol with those friends. Whatever your preferred drink, you should be aware that alcohol and teeth are not exactly the best of friends. Below, we have listed a few of the ways that alcohol can affect your teeth and why you may want to consider limiting the amount of alcohol that you ingest. Sugar: Luckily, the average person is already well aware of the fact that sugar is not good for teeth. Decades of PSA’s and lecturing from dentists has drilled it into the collective conscious that sugar will, if left to its own devices, destroy the teeth in your mouth. Unfortunately, fewer people are aware of the fact that alcohol, by its very nature, contains quite a bit of sugar. The bacteria in your mouth love sugar and if you are used to imbibing a few times a week, you may be giving that bacteria all the fuel it needs to wreak havoc on your mouth. If the thought of giving up alcohol altogether is just not an option, we suggest that you go for dry wines. These wines tend to contain the least amount of sugar out of nearly all alcoholic beverages. Dehydration: Although alcohol is a liquid, it actively works against your body in relation to hydration levels. Alcohol consumption can lead to a decrease in saliva within the mouth which in turn prevents bacteria in the mouth from being naturally washed away. This allows bacteria to cling to teeth longer, increasing your risk for oral health issues such as tooth decay. Often, this side effect can be mitigated by alternating water with alcoholic drinks or, if water is not readily available, chewing sugar-free gum or sucking on a mint to increase saliva. Join us again next time as we continue to cover some of the ways that alcohol can affect your overall health and what you can do to help mitigate the effects. 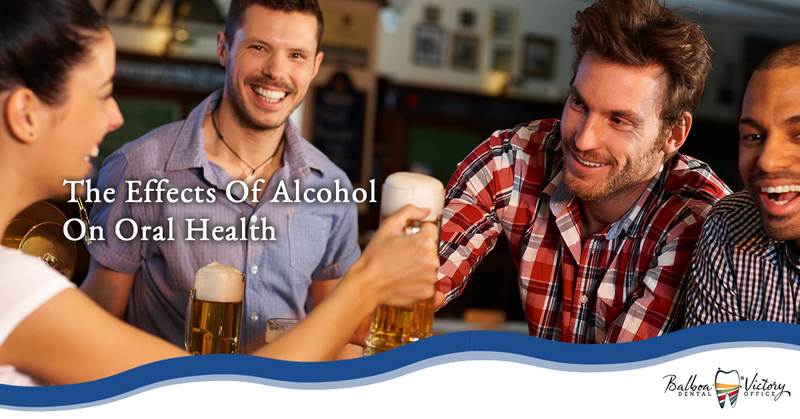 If you are worried that you may already be suffering the effects of alcohol use in relation to your oral hygiene, contact us today at Balboa Victory Dental Office and schedule an appointment. We will perform a complete oral health check up and help you with any issues that you may be having.